The Sky-Watcher 10" DOB: The Sweet-Spot for Aperture and Value! This is a big, friendly horse of a telescope you can ride off into the sunset with, and then thrill to well resolved celestial views when twilight fades. The SW 10" DOB is an very satisfying telescope to own, an instrument that will provide a lifetime of continuing exploration of the heavens. This telescope will hit the sweet-spot for many amateurs, providing all the capability and value you are seeking in a large aperture telescope. Sky-Watcher's revolutionary truss-support concept allows the optical tube's front and back cells to collapse together, aligning on the truss support rods which can then be locked down for easy and secure telescope transport. This one piece, low-hassle OTA design is mechanically simple and results in a large aperture telescope that can be reasonably handled and transported by one individual. This innovation gives Sky-Watcher users tremendous functional ease-of-transportability. In viewing deep-space, aperture matters—big time! With this telescope you have tremendous light gathering power. Prominent deep-space objects seen well in an 8" SW DOB, such as diffuse emission nebulae in the summer sky like the Lagoon (M8), Trifid (M20), and Swan (M17); the stunning globular star clusters M13 and M92 in Constellation Hercules; the awesome winter sky's Great Orion Nebula (M42) in Constellation Orion, and our enormous local galaxy group companion the Andromeda Galaxy (M31) in Constellation Andromeda, to name a very few, will appear more spectacular, brilliant, and wider in extension in a SW 10" DOB. Many challenging objects for an 8" aperture now come into their own with the SW 10" DOB: the planetary nebula the Crab (M1), a supernova remnant, requires a 10" aperture to truly begin to appreciate the several subtle, gaseous filamentary structures. M33 the spiral galaxy in Constellation Triangulum exhibits significantly more open arm structure. The Rosette Nebula in Monoceros begins to show the discernable pattern of a blooming rose. M51, the fascinating spiral Whirlpool Galaxy, displays remarkable greater structural detail in a 10" aperture vs. 8" diameter size telescope. There is no question the incremental resolving power of a 10-inch aperture is visually impressive when compared to an 8-inch. Therefore, it is no wonder then that the 10" aperture is overtaking the 8" as the serious amateur astronomer's aperture of choice in a Dobsonian telescope. Sky-Watcher's compact, collapsible optical tube design makes the decision to step up in aperture to a 10" even easier. Sky-Watcher 10" DOB – a Class Act! 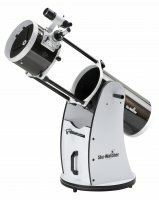 The Sky-Watcher 10" DOB utilizes quality components throughout. Pride of workmanship manifests itself in high quality standards of optical and mechanical fabrication. The polishing process for primary and diagonal mirror yields smooth mirror surfaces ensuring good contrast, and properly corrected optics show minimum alterations to the optical wave-front. Observing with a Dobsonian has been described akin to shooting ducks in a gallery because it is so easy to find your target. Just swing your SW DOB to the quadrant of sky to be searched, and scan the vicinity. An 8x50mm Right Angle optical viewfinder provides both magnification and light gathering to help narrow your search for those elusive fuzzies when star-hopping. The standard-equipment backlash-free 2" Crayford Focuser insures ultra smooth focusing adjustments. Multi-coated, 4-element Pl?ssl eyepieces (25mm and 10mm) provide a spacious 52? Apparent Field of View. To ensure mechanical ease-of-use, SW uses a high-performance Teflon bearing system in both axes combined with tension adjustment in altitude to facilitate setting the appropriate amount of friction, assuring smooth vertical and horizontal manual movement without free-play from small bumps or gusts of wind. This also eliminates the need to have a balanced optical tube as in an equatorial mount. Sky-Watcher's Teflon bearing system is preferable to the use of ball-bearings. Ball-bearings make unintended movement of the optical tube more difficult to control. Fortunately, at low power, deep-space objects leisurely drift through the field of the SW 10" DOB, so constant mechanical adjustment of the telescope's orientation isn't needed to keep objects in the field of view.